I have a plan. I have 4 weeks left until I’m done with my grad school program in Acupuncture. It took me 5 years with innumerable highs and lows, and I am bound and determined to finish on that last day with my health in tact and my energy high. So my plan is that every time I crack the books, or treat a patient in the clinic, I am armed with an herbal concoction in my teacup. Nettles is my go-to herb in this plan. It is so rich in minerals and such a perfect springtime herb for the liver. Somedays I add a little dandelion for an extra livery boost, or some skullcap or oatstraw to soothe my nerves. Last week I felt run down so I added a teaspoon of dried elderberries. I know a lot of you out there are feeling spring take off while you’re still coming out of hibernation, and I’d strongly suggest nettles to get you through. And, if you have seasonal allergies you might notice some improvement from the nettles as well. When I make medicinal tea I’m not shy with the herbs. Take a big fistful and then add a few cups of boiling water to the pot and let them infuse for at least 30 minutes. I usually make a big pot at night and let it infuse overnight and then strain it in the morning and sip on it all day. 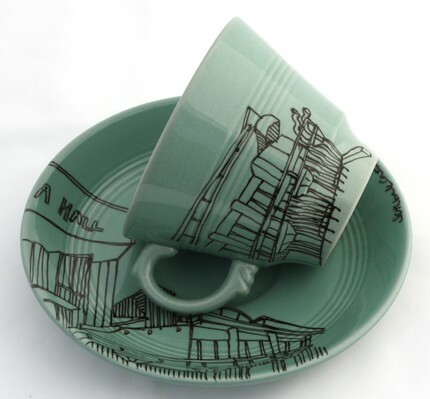 Now, if only I could be drinking this tea out of Esther Coombs amazing tea cup and saucer that is in the picture above. The drawing is done by hand with a ceramic ink pen, beautiful! Check out her etsy shop here.